Expect to hear about living standards – stagnant pay packets, zero hours contracts, a lack of affordable housing, rising energy and water bills – from Ed Miliband in Brighton next week. The Labour leader knows that his party’s greatest electoral advantage is painting the Conservatives as looking out for their wealthy friends, not hard-pressed families struggling to get by even when the national economy is seemingly on the road to recovery. Osborne knew he had to pre-empt Labour’s attack. Last week, he delivered an important speech. He signalled that while the economy was showing positive signs of life, much more needed to be done to ensure that everyone in the country could benefit from the proceeds of growth. The real challenge for the Chancellor is to show the British public that he can deliver on his promises. To do that he will need to announce a coherent set of economically sensible policies that cuts through to people already deeply disillusioned with politicians and distrustful of big shiny policies. Professor Richard Wyn Jones is Director of the Wales Governance Centre at Cardiff University. He is an expert on devolved politics and is one of the co-authors of the newly published IPPR report England’s Two Union: And Anatomy of a Nation and its Discontents. He is happy to confirm the suspicion that he is, indeed, Welsh. Conservatives may have enjoyed the obvious discomfort of the BBC when it was forced to admit last week that it had failed to give due prominence to concerns about very high levels immigration into the UK because public attitudes were not consistent with the “liberal bias” of corporation programme makers. But it is not only liberals, or socialists for that matter, that can find some public attitudes so challenging to their own biases and preconceptions that they find it easier to ignore them. Perhaps the most glaring example in contemporary British politics is attitudes to the anomalous – and, in English eyes, iniquitous – position of England within the post-devolution United Kingdom. When it comes to England, with very few exceptions, the British political class as a whole seem to find denial or displacement much easier than serious engagement. Tim Knox is Director of the Centre for Policy Studies which today publishes Double up on Heathrow: a simple, privately funded, affordable and achievable solution. Follow the CPS on Twitter. One of the moments of great joy in the think tank world is when you come across a brilliant idea that is both eminently practical and ideologically attractive. The pamphlet published by the Centre for Policy Studies today, Double up on Heathrow certainly meets both these goals. It is, firstly, a fatastically simple proposal which would almost immediately double capcacity at Heathrow while also alleviating many of the environmental and noise concerns of current residents. This can be achieved by extending both of the existing runways up to a total length of about 7,000 metres and then cutting them in half so that each runway becomes two full-length, runways, allowing simultaneous take-offs and landings. The number of available slots at Heathrow would almost double, thereby reducing delays and improving the airport’s resilience and efficiency. Importantly, this would also allow some runway alternation throughout the day. Such a scheme would – in infrastructure terms – be remarkably quick to develop: significant new runway capacity could be completed within five years. For local residents, it would also be quiet – the extra capacity could allow the airport to open later in the morning and could enable innovative noise reduction techniques. Very few, if any, new areas would be brought into the airport’s noise footprint. In addition, early morning arrivals could land more than two miles further west, reducing noise over London. Nathan Gamester is a Programme Director at the Legatum Institute. 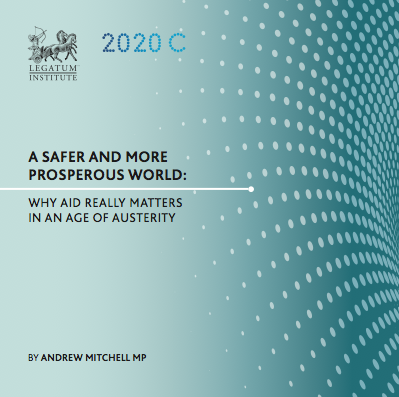 Today, in partnership with the Legatum Institute, Andrew Mitchell has published a pamplet, A safer and more prosperous world, laying out his vision for British international development. The pamphlet marks Mitchell’s return to the political stage; his first major intervention since resigning as Chief Whip last October. Opposition to the Government’s development policy – especially among Conservatives – is well documented. At a time of slow economic recovery and budget cuts right across Whitehall, the commitment to increase spending on overseas aid has never been more controversial. Many who question this policy ask whether it can be justified when so many Britons are suffering at home. There is often talk of aid cash “sloshing” around the international system only to end up in the pockets of corrupt government officials instead of going to those who actually need it. To those sceptics, Andrew Mitchell’s message is clear. Firstly, we have a moral duty to help those who cannot help themselves. Secondly, this old view of how aid works is wrong. Aid does work, argues Mitchell. It is not simply about “soft-hearted altruism”. Rather it is about protecting our own national interests and ensuring our own security. And aid gets results. Mitchell’s pamphlet is a timely reminder of an area of government policy in which British people should take pride. If you are a British taxpayer, then right across the developing world are children who have been vaccinated against a multitude of deadly diseases because of you. Today millions of children are going to school for the first time – because of you. Fewer women are dying in childbirth – because of you. More AIDS sufferers than ever before have access to antiretroviral therapy and are thus living with, rather than dying from, their disease – because of you. British people should be proud of this. On the issue of international development, there is no doubting Mitchell’s expertise. For most of the last decade he has been the chief architect of this area of Conservative policy. He spent five years as shadow development secretary followed by more than two years as Secretary of State until the Prime Minister decided he wanted Mitchell permanently in Westminster as his Chief Whip. News of his departure from DFID came as a surprise to many (although today’s pamphlet suggests that he has unfinished business with this area of policy). In Government, it can be rare to find senior ministers who feel a strong sense of both calling and enthusiasm for the portfolios to which they have been assigned. Andrew Mitchell, however, seemed well suited to International Development. It was back in 2009 that the Conservative Party published its comprehensive Green Paper, One World Conservatism in which much of what is now government policy was set out: the focus on wealth creation as the most important driver of development; the recognition that peacekeeping and conflict prevention are fundamental to development; the need to ensure value for money and accountability for every penny spent; and perhaps most controversially, the commitment to increase the UK aid budget to 0.7% of national income. Many people who have served in government can take credit for ensuring Britain keeps its promise to the developing world. But perhaps the most significant of those is Andrew Mitchell. Mitchell has been called many things over the last six months, many of these it now appears were untrue. However, his lasting legacy – and perhaps one of this government’s most significant legacies – will be the commitment that is being shown to the world’s very poorest people. Nathan Gamester is a Programme Director at the Legatum Institute. Follow Nathan on Twitter.